The impact of Superstorm Sandy on New Jersey was enormous: nearly 346,000 housing units either destroyed or damaged and 190,000 businesses affected.1 Sandy demonstrated just how vulnerable to damage much of the low-lying areas in the state are to major flooding events. Because the storm’s devastation was so severe it became apparent to state policymakers and regulators that the past construction norms and flood elevation levels in these areas would have to be significantly altered for any rebuilding. Moreover, developers and property owners alike were faced with the uncertainty of rising flood insurance premiums and huge reconstruction costs.On January 24, 2013, Gov. Christie approved emergency regulations proposed by the New Jersey Department of Environmental Protection (DEP) that set forth revised rebuilding guidelines in the flood hazard areas throughout the state. The amended Flood Hazard Area Control Act (Flood Act) regulations, among other things, adopt the Advisory Base Flood Elevation (ABFE) maps that were recently updated by the Federal Emergency Management Agency (FEMA). According to the DEP statement accompanying the emergency rules, the objective of the new regulations is to encourage residents and businesses of New Jersey to rebuild stronger and as soon as possible and to do it using the best available flood elevation data for setting proper design elevations. Please use the Support Us feature in the upper right corner of the homepage to assist the production of this blog. 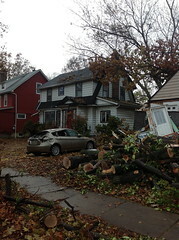 This entry was posted in Building Safety, Business Community, Hurricane Sandy by recoverydiva. Bookmark the permalink. There are ways to build basements in flood zones. Here is a link to the National Flood Insurance Program guidance regarding basements (http://www.fema.gov/national-flood-insurance-program/basement). Though states and/or local municipalities can make their building code requirements more stringent if they choose (http://files.dnr.state.mn.us/publications/waters/floodplain_management_fact_sheet_4.pdf). Regarding lack of basements in the Midwest, as I live in North Texas, I can explain that, at least in our part of Tornado Alley, the expansion/contraction of the clay soil here plus the limestone beneath makes constructing and maintaining basements a very expensive undertaking. We have a hard enough time just trying to keep home foundations level…. As the Recovery Diva underscores is the rather significant changes being made to building codes in effort to minimize the impact of future storms. Those are efforts with appluading. In the midwest they do not have basements, so they have no place to hide from a tornado. It seems you cannot live with or without them! And I understand the mold problems are very serious. I wonder how NJ and NY will cure the basement problem. That being how can you have underground basements in a flood zone?